Skeletal muscle - Regeneration in a male Harlan Sprague-Dawley rat from a subchronic study. Myoblasts and cytoplasmic basophilia (arrows) characterize regeneration of a previously damaged muscle fiber. 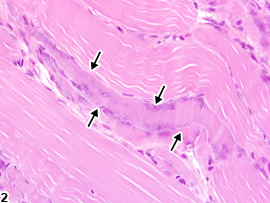 Skeletal muscle - Regeneration in a male Harlan Sprague-Dawley rat from a subchronic study. 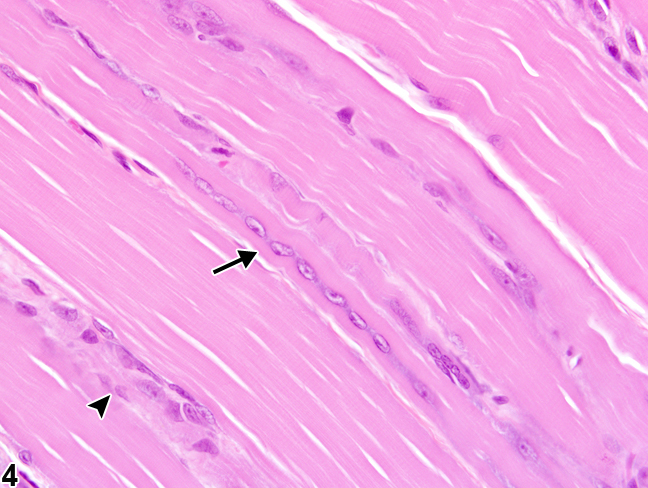 Myoblasts with vesiculated nuclei and prominent nucleoli in a regenerating muscle fiber (arrows) are present. 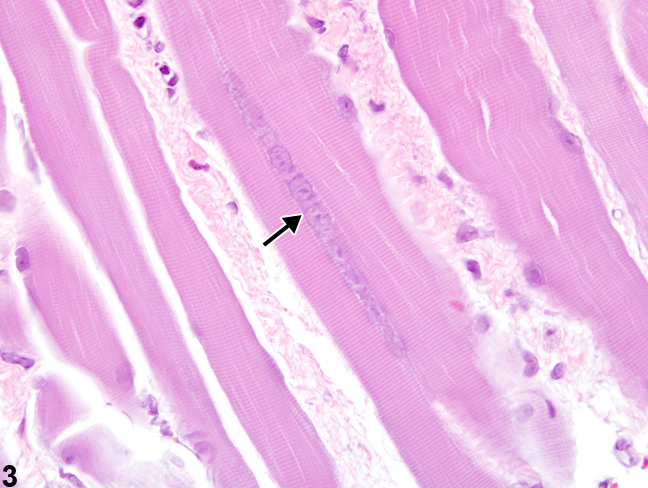 Skeletal muscle - Regeneration in a male Harlan Sprague-Dawley rat from a subchronic study. 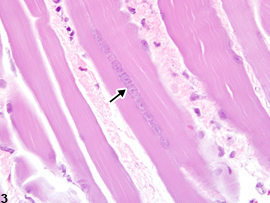 A row of internal nuclei (arrow) is present within a regenerating muscle fiber that has lost its basophilia. 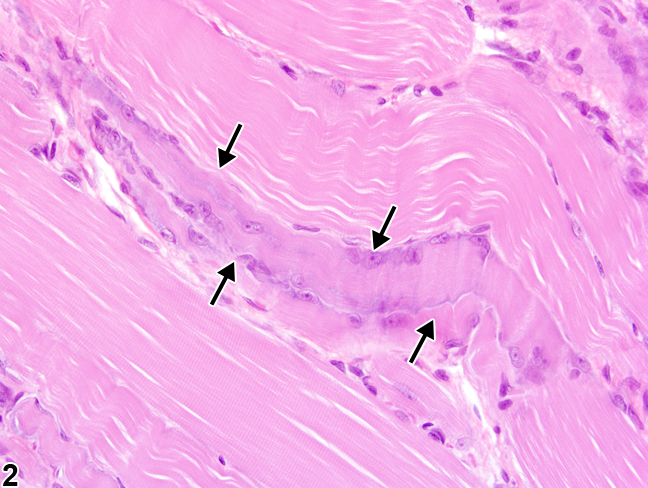 Skeletal muscle - Regeneration in a male Harlan Sprague-Dawley rat from a subchronic study. 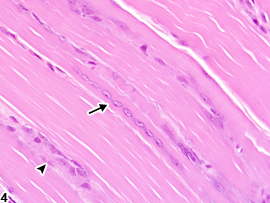 A row of internal vesiculated nuclei (arrow) is present in a regenerating muscle fiber; myofiber degeneration is present in a nearby muscle fiber (arrowhead). 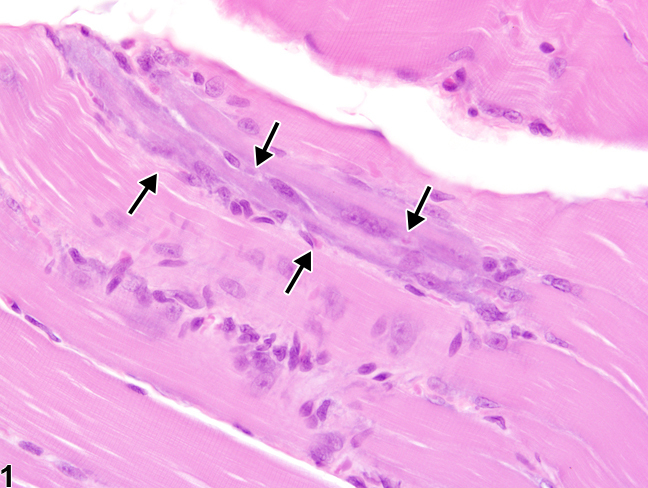 Regenerating skeletal muscle fibers are histologically characterized by the presence of prominent (activated) stellate cells, rows of internal myoblast nuclei, and cytoplasmic basophilia ( Figure 1 and Figure 2 ). While in most species internal nuclei tend to peripheralize early in regeneration, rodents tend to retain their internal nuclei for some time. This can serve as a marker for fibers that had previously undergone necrosis and regeneration. These fibers often lose the characteristic basophilic staining of an actively regenerating myotube ( Figure 3 and Figure 4 ). Regenerating myofibers are commonly present within or near areas of active necrosis or degeneration, and the degree of regeneration present will be influenced by the amount of time that has passed between the injurious stimulus and sample collection. Occasional rowing of nuclei in the absence of prior or concurrent myotoxicity likely reflects background cellular turnover and repair and does not warrant a diagnosis. Nutritional, exertional, and toxic myopathies can result in extensive regions of muscle damage; however, repair is often extremely effective. In contrast, the reparative process following damage due to ischemia is often ineffective. This is likely due to the subsequent death of the satellite cells and endomysial cells. Extensive regions of fibrosis often result. Regeneration should be recorded and graded when above background levels. When regeneration is associated with concomitant myofiber degeneration, it does not need to be recorded separately unless warranted by severity, but it should be described in the pathology narrative. Concurrent myopathic changes, such as inflammation or fibrosis, should also be recorded and graded separately when warranted by severity.